For many people, geotourism sparks images of the Grand Canyon or Yosemite. These sites have become monsters for mass geotourism. While these destinations are beautiful, they are often degraded by the tourism itself. The sheer number of visitors to these destinations has taken away from their splendor. The Grand Canyon and Yosemite of today have little resemblance to how they looked when Native Americans first set eyes on them. The idea of appreciating the beauty and power of nature have been forgotten by many in our society. Today people visit these areas to cross it off their “bucket list”. I thought it would be nice to take a moment and explore a natural wonder that is not as well known or as likely to be trampled over. I have decided to discuss Mt. Adams in Washington. It is known to be the least known and visited of the peaks in the Cascade Mountains chain. However, one look at it and you have to wonder why. This area has been designated a wilderness area so that it is designed to be left intact with no major changes allowed. This has helped to preserve the mountain and the surrounding area from destruction by tourists and businesses alike. They have taken large steps to ensure the mountain remains raw and as untouched as possible. The mountain has excellent climbing routes as well as hiking and camping. The park has instituted a “Leave No Trace” program to challenge visitors to pick up after themselves. The program also advises visitors to come in small groups to limit the number of visitors in the area. They are also advised to use established campsites and not use the river to wash. The mountain which is part of Gifford Pinchot National Forest also acknowledges that the land was home to Native Americans for thousands of years before it was turned into a park. The park gives berrypicking and hunting rights to the local tribes and promotes the continuation of their culture. 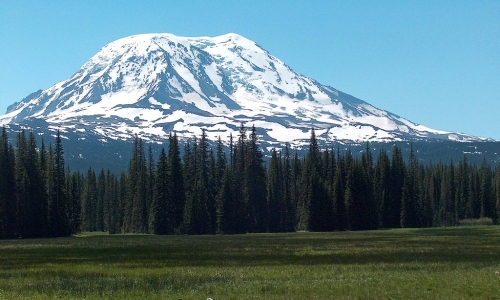 Mt Adams is proof that you can allow people to come and visit and experience all the area has to offer while still protecting the environmental integrity of the area. There does not need to be large scale development to have a successful site. This site combines hands on site management of resources with providing a safe and fun place for people to visit. They have kept strict control on the number of guests. The downside is that less people know about this site. There has to be an equilibrium between proper number of annual guests and better financial performance in order for this area to thrive. This problem raises an important question in ecotourism: Where do you draw the line between preservation and economic success? This site could easily become another mass ecotourism site if it is developed and promoted on a much larger scale. However, some small improvements and increased marketing (possibly on a more local scale) could help the local economy.